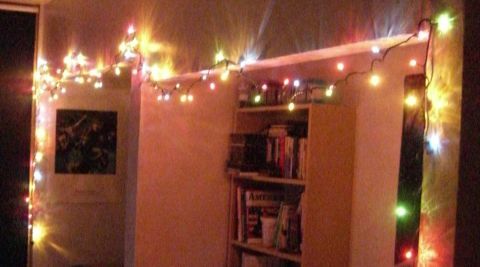 I have to say, I’m very happy with my investement in a string of Christmas lights. They light up my apartment pretty nicely all on their own, and they make me happy. It kind of makes me want to go back to Zellers and buy three or four more strings to put around everywhere. Alas I don’t think the budget can support it. At some point my place would probably start to look like some kind of 60′s psychedelic love pad… not that that’s a bad thing, of course.